Five Indiana players scored in double figures, led by Romeo Langford (0) with 22. BLOOMINGTON, Ind. — Indiana coach Archie Miller challenged his defense to play with the same intensity and passion it showed last week. The encore performance was even better. The Hoosiers dominated one of the nation’s most potent offenses by forcing a string of early turnovers, drawing fouls and converting miscues into points in a 96-73 blowout of No. 24 Marquette on Wednesday night. It went just the way Miller had hoped. After giving up 90 points combined in last week’s first two victories, Indiana (3-0) demonstrated it was no fluke. The Hoosiers limited Marquette to 42.4 percent shooting from the field and 5 of 21 on 3-pointers. They forced 14 turnovers and never let the Golden Eagles (2-1) get closer than 18 after scoring the first seven points of the second half. Five Indiana players scored in double figures, led by Romeo Langford with 22 and Evan Fitzner with 16. But the most impressive performance came from freshman point guard Rob Phinisee, who had 12 points and eight assists and held Markus Howard in check most of the night. Howard scored half of his 18 points after the outcome already had been decided. Sam and Joey Hauser each scored 18, but they didn’t get nearly enough help in a game that was never close. The Hoosiers took advantage of four turnovers in the first 2½ minutes by jumping to a 19-4 lead. Marquette never got closer than seven the rest of the night, and Indiana sealed the victory by scoring the final five points of the first half and the first seven of the second half to make it 54-34. “Obviously it’s not what you want but sometimes you need it to happen in order to understand how to prepare for a game like this,” Sam Hauser said. “We’re going to take this and we’re going to get better. 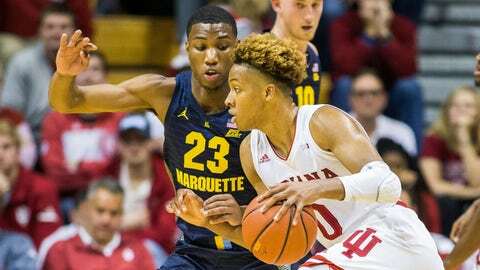 Marquette: The Golden Eagles climbed into the Top 25 after two impressive wins but will likely fall out after a slow start doomed any chance they had at Indiana. Indiana: If anyone doubted the Hoosiers’ performance against two small-school opponents last week, they shouldn’t now. Indiana looked every bit as efficient offensively, as effective defensively and as overwhelming overall against an NCAA Tournament hopeful. Marquette: The Golden Eagles only led once, 2-0. … Jamal Cain had a team-high seven rebounds and Howard had four of the Golden Eagles’ eight assists. … It was Marquette’s appearance in Assembly Hall since 1985. Indiana: Juwan Morgan and Aljami Durham each scored 13 points. Morgan also had eight rebounds. … Miller improved to 2-7 against ranked opponents in two seasons with the Hoosiers. … Indiana shot 63.6 percent from the field — the best percentage since Miller took the job. … Indiana had a 50-32 scoring advantage in the paint and a 21-5 edge in fast-break points, improving to 3-0 for the eighth time in nine years. Marquette: “They made things difficult for me at the start of the game, but I’ve got to handle that a lot better,” Howard said. Indiana: “The first 10 minutes, I thought we were really dialed in on defense and made a lot of plays that led to offense,” Miller said. Marquette hopes to rebound from its first loss when it hosts Presbyterian on Saturday. Indiana can start 4-0 for the first time since 2014-15 with a win at Arkansas on Sunday.